Lemons For All: Food Thoughts and Recipes To Share | Life's bounty is immeasureable. Spread what you can. Life's bounty is immeasureable. Spread what you can. Thanks to the courageous olive farmers, olive oil entrepreneur/retailers, and chatty food writers and cookbook authors, people are starting to understand the difference between a mass-produced bottle of inexpensive olive oil and an in-house produced bottle of luxurious extra-virgin olive oil. Come November, these artisanal in-house olive oil producers are releasing their first press of olive oil, known as olio nuovo. Il Fiorello Olive Oil Company just sent me a sample of their olio nuovo and we cracked it open last night and tasted it with a fresh loaf of whole grain bread. It was utterly sublime. Tasting fresh-pressed olive oil, the first olive oil of the season, is akin to tasting freshly uncovered truffles. You can literally taste the provenance in each bite. All over the world where olives are milled, there’s a half-eaten piece of fresh bread (and spoon) resting near the milling equipment as there is nothing like sampling oil straight from the source as soon as the olives are milled. Procuring a bottle of olio nuovo is the next best thing. Unfiltered and cloudy, Il Fiorello’s olio nuovo is milled in their state-of-the-art facility using machinery that self-regulates things like temperature and output. Heat is enemy number one when processing olive oil and if the oil gets too hot during the process, all the good in it like antioxidants are destroyed. So the next time you pour that $5 bottle of olive oil over your salad, well, you might as well use any other oil because practically all of the health benefits are lost. Manufacturers and bottlers that sell olive oil that inexpensive are using a different type of pressing system that elevates temperatures to the point of no return. With olive oil this fresh and good, it must be enjoyed unadulterated and drizzled on foods where its grassy, herbaceous, and buttery flavors can be enjoyed. 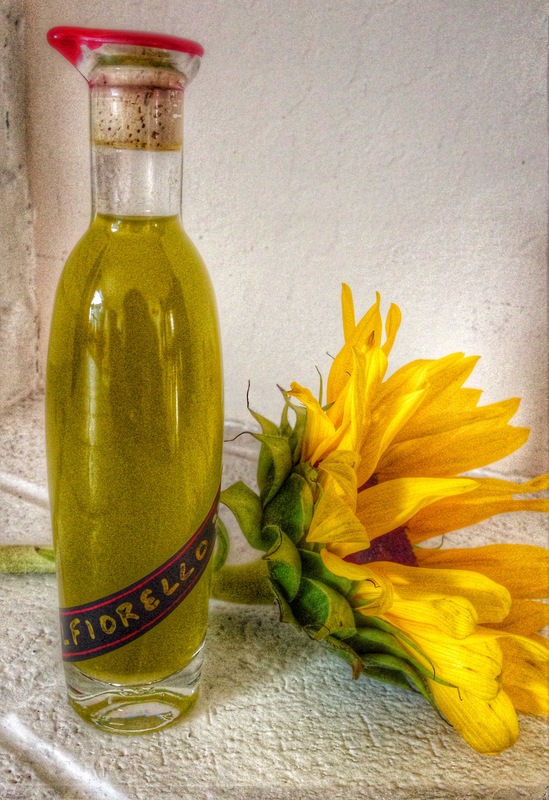 Ann Sievers, owner of Il Fiorello, recommends drizzling her olio nuovo over vanilla gelato and finishing with a sprinkle of sea salt. I couldn’t agree more. There are only a handful of olive growers that also mill on-site in the greater San Francisco Bay Area, and Il Fiorello welcomes visitors to taste and tour their facilities. It’s the only way to procure a bottle of this first-of-the-season treat so book your visit now before it sells out. To learn more about California olive oil, visit the California Olive Oil Council. Chef Vlad orienting students before instruction began. 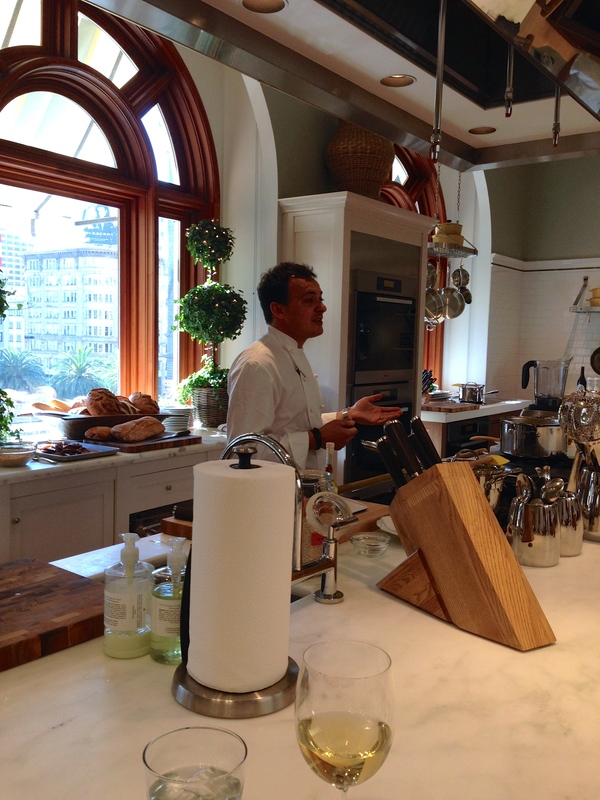 Recently I was invited to attend a cooking class at Williams-Sonoma‘s Union Square location on Post Street in San Francisco. There’s no question that founder Chuck Williams changed the way Americans cook today. His vision of importing French cookware to his original Sonoma shop in 1956 and selling them to home cooks revolutionized how we interpret and enjoy food. 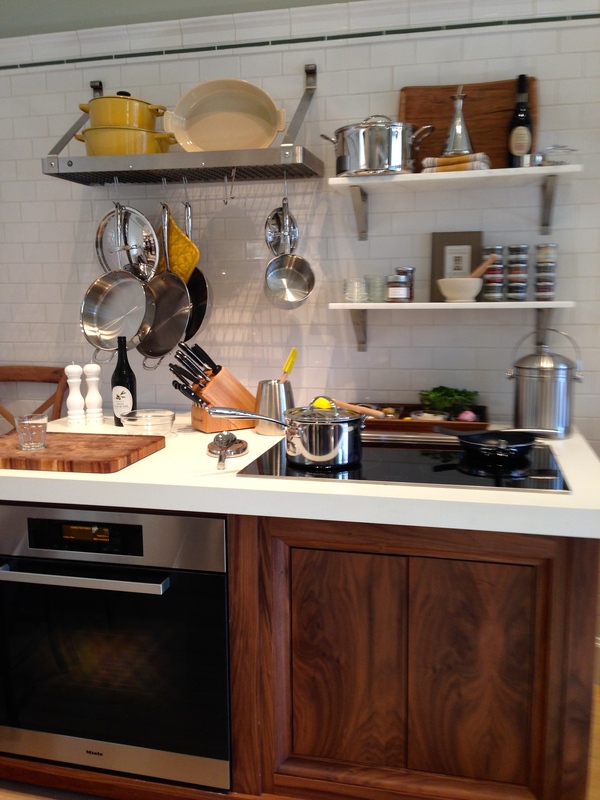 Individual cooking stations equipped with Meile oven, induction cooktop, and an enviable amount of W-S cookware. Just a few weeks in to this new concept, the classes really personalizes the cooking experience. 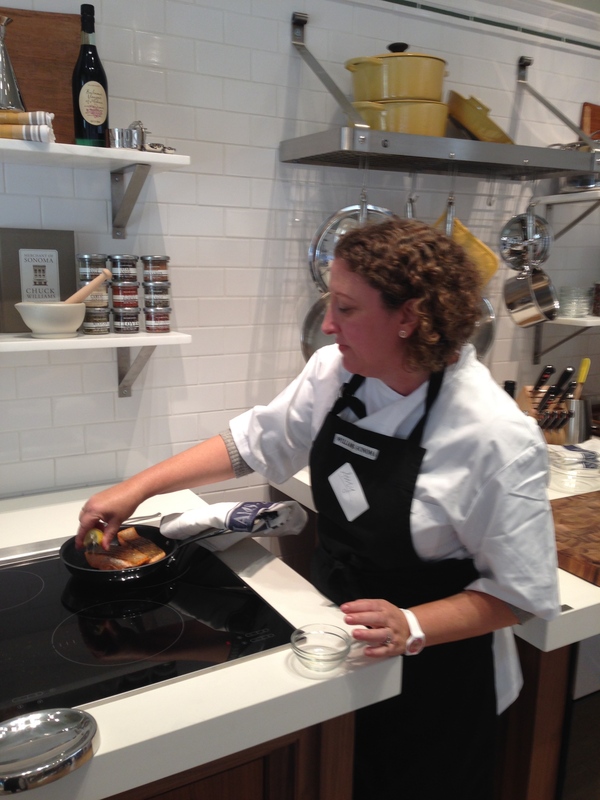 They also provide attendees the opportunity to not only sit and enjoy demos from one of the resident or guest chefs, but also allow attendees to work with Williams-Sonoma products at mini kitchen stations equipped with Miele appliances. Currently, classes are held at three of their storefronts: San Francisco’s Union Square, Chicago’s Lincoln Park, and Sydney’s Bondi Junction Station. Upon arrival, everyone gets a crisp white chef’s coat, apron, and kitchen towel. Once properly dressed, we all gathered around the expansive marble island and listened to Chef Vladimir Niza talk about our menu. Chef Vlad is in charge of the company’s culinary programs including the new curriculum and has extensive experience and education in the culinary and nutrition field. Classically trained with degrees in nutritional science, he’s the perfect balance of charismatic European chef and scientist. Chef Aaron Clarke oversees the Union Square program and is personable and knowledgeable counterpoint to Chef Vlad’s demeanor. Needless to say, I felt in good company. 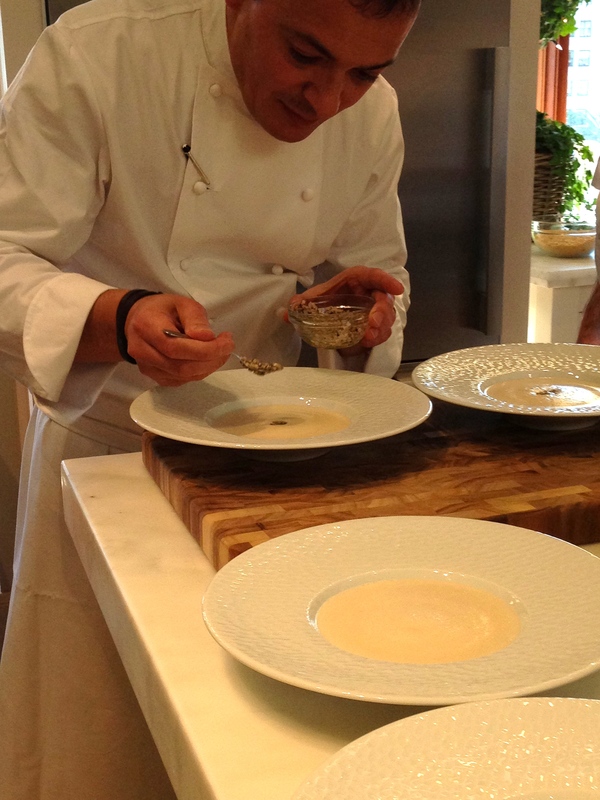 Chef Vlad sprinkling fresh truffles on top of our first course, Jerusalem Artichoke Soup. Chef Vlad prepared our first course, a puree of Jerusalem Artichokes with Truffles and Jerusalem Artichoke Chips, and demonstrated why every one that can afford a Vitamix should own one. Wow, no fine sieve required, with this baby. A silky smooth soup with a 60-second whirl. Working at our individual station, preparing our main course. 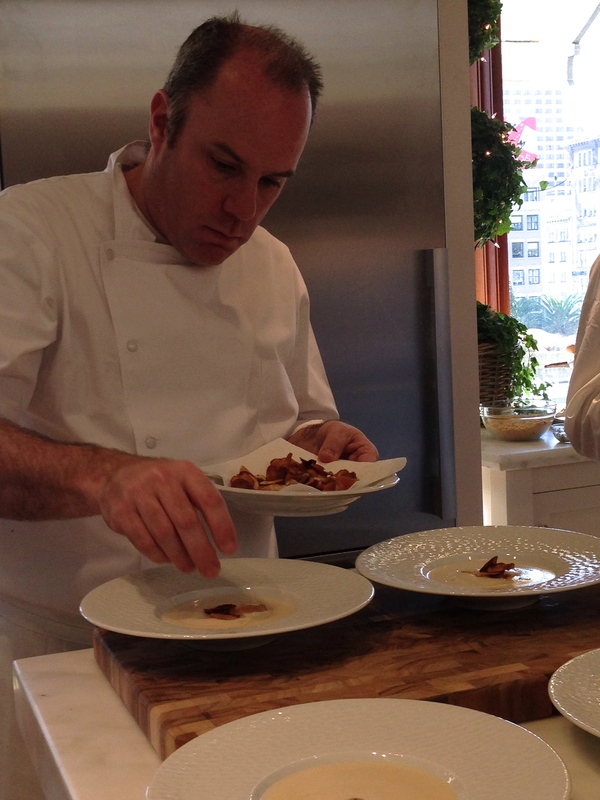 The main course was demo-ed by Chef Vlad and after watching him prepare it, we paired up and headed to our stations. 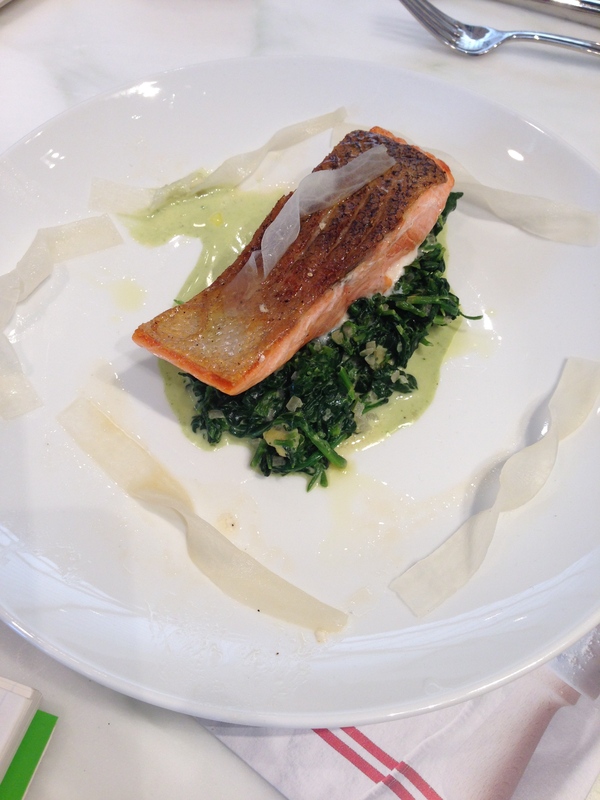 The dish, Pan-Fried Fillet of Wild Salmon with Spinach and Watercress and a Wasabi Cream, was technical enough to please those with some cooking knowledge, yet not overly challenging for those with only basic skills. 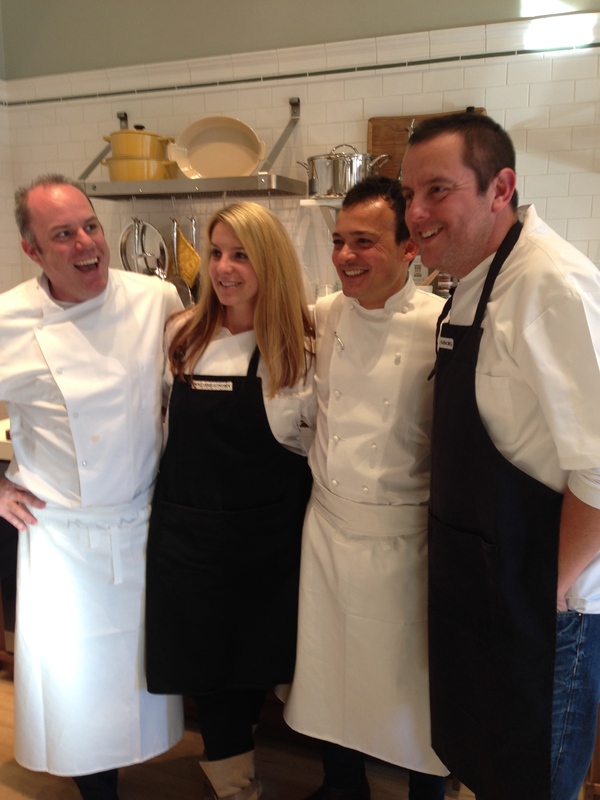 Besides both chefs, there were plenty of W-S assistants on hand to check our progress and answer questions. The highlight for me? Working on a commercial-grade induction stovetop. Me want one. Badly. 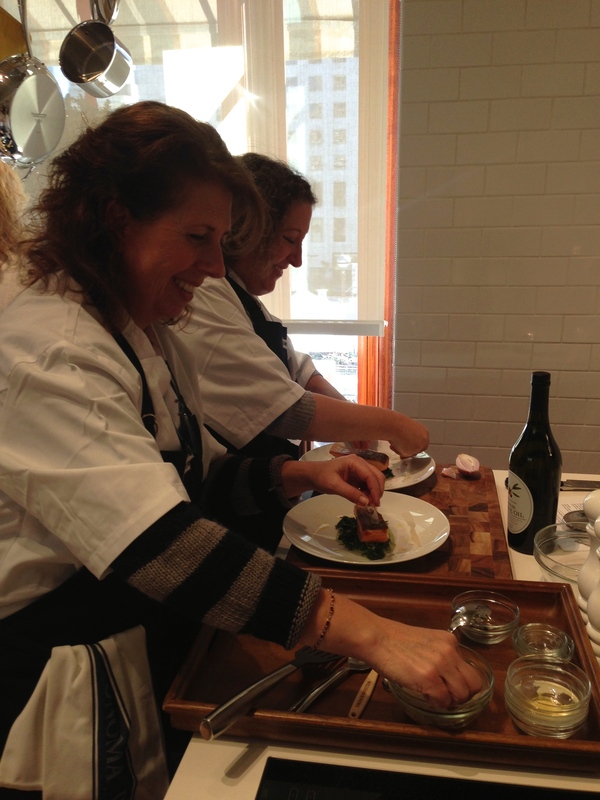 My cooking partner, cookbook author and food blogger Amy Sherman, in charge of the salmon. Really, though, how many times have you visited a high-end cookware shop, picked up a knife or pan, and not followed through with the purchase, in part, because you are unsure how effective the tool will be to you once you get home? These classes really are an opportunity to test cookware, knives, and other kitchen accouterments before purchasing. Appliance showrooms allow prospective buyers to take a $5,000 oven for a test drive, so why not try out that $100 sauté skillet before you buy? Genius. If this flies, it will snuff the showroom talk, no doubt. Yes, you might be able to purchase similar products at a slightly cheaper price elsewhere, but if it ends up sitting in a drawer, then you’re out that money either way. If all of the dishes are this carefully selected, then W-S will have no problem filling seats. The recipe was decadent and elegant without being overly fussy or technical. Impeccable ingredients were sourced locally and on par with what you would find at a nicer SF restaurant, which is another factor that really sets this program apart. 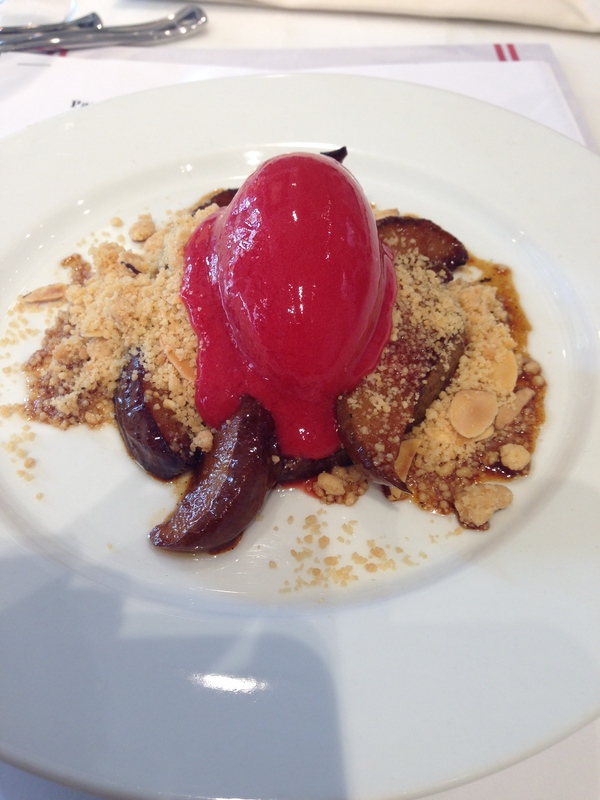 Poached Pears with Raspberry Sorbet and Almond-Cookie Crumble. Talked so much it began to melt. Still delicious! Chef Vlad prepared dessert while we all went back to our seats to marvel at each other’s plates. We all ate very well that day. Chef Aaron, Chef Vlad, and Star (101.3) Mornings DJs Marcus D and Sandy. Class topics range from basics like Essential Knife Skills to advanced techniques like Butchery & Cooking: Nose to Tail. Classes also vary in length, theme, and season. Check out the calendar here. You can sign up for a two-hour DIY Workshop or enroll in a 5-day intensive. Chef Aaron putting the finishing touches on the soup. Williams-Sonoma was kind enough to forward the soup recipe. Enjoy! Jerusalem artichokes are wonderfully nutritious and versatile. This simple soup is the perfect way to enjoy them on a cold day. Serves 6. On a low heat, sweat the onion for 5 minutes in the butter and peanut oil. Add the artichoke, sweat for a further 3 minutes. Cover with milk then simmer gently for 20 minutes. When cooked, the artichokes should be totally soft. Puree in a blender until fine. Add a little more milk if the soup is too thick and season to taste. Serve with a little chopped parsley and croutons. Or, add a small amount of finely chopped truffles, drizzle with truffle oil, and garnish with a few deep-fried Jerusalem artichoke chips. I think I make too many biscotti. Must be my addiction to a hot cup of something. The writing life is a lonely one, and having a hot cup of coffee, tea, chocolate, even lemon-flavored water keeps my fingers nimble and my attention focused. An unexpected mis-labeled bag of white flour turned out to be a new idea for biscotti. I usually make a traditional Greek biscotti, flavored with anise seed and Ouzo, and as I opened a new bag of flour yesterday, I noticed little brown flecks of outer bran? Whole-wheat flour was my guess, but really who knows. With only corn flour in my cupboards, I substituted my second cup of white flour for corn. Now I know the Greeks discovered a lot of things, but corn isn’t one of them. Thankfully, the flavors didn’t clash and actually tasted rather nice together. The corn flour also lends a nice crunch and added layer of sweetness. It’s my version of the Old World meets New World sweet. Makes two small logs, and when cut, about 24 cookies. 1. Whisk together flours, powder, salt, and anise in a bowl; set aside. 2. In another bowl, whisk together softened butter and sugar, either by hand or in a standing mixer, until light and fluffy. Add egg and Ouzo and mix well to incorporate. Add the flour mixture and mix to combine. Cover the dough and chill for at least an hour. 3. Place oven rack in center of oven and pre-heat oven to 350°. Remove the dough and divide evenly in half. On a large sheet pan, form each portion of dough into a log, lengthwise on the pan, so that it is approximately 4-inches wide by 12-inches long. 4. 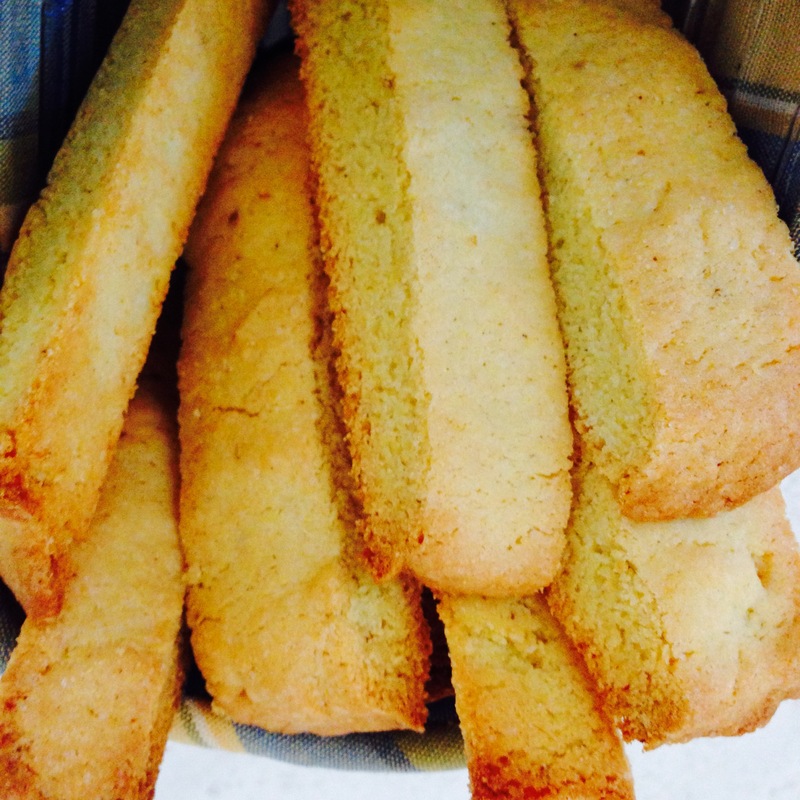 Bake biscotti logs until they lightly brown on the edges and set to touch, about 15 minutes. Remove pan from the oven and allow the logs to rest for about 3 minutes. One at a time, remove a log and place on a cutting board. At a slight angle, slice log into 1-inch strips, and return biscotti to sheet pan. Repeat with second log and place pan back in the oven for another 7 minutes. Remove pan and cool cookies until room temperature. Store in an air-tight container for up to one week. This is the third time I’ve had the pleasure to put pen to paper about these boys. I was first introduced to them when I wrote about the Mason jar for the San Francisco Chronicle. Next, when they came out with a cocktail kit, I introduced Chronicle readers to this nifty way to transport your favorite mason shaker cocktail to your outdoor (or indoor) setting. Now these two have just self-published their first cocktail book, Shake: A New Perspective on Cocktails. If you follow their Instagram, then you are familiar with these seasonal beverages and the alluring way they present ingredients, steps, and the finished product. I’ll be right back. Really must pour myself something. Similar in style to Yvette van Boven’s photograph and illustrated hybrid cookbooks, Shake is quirky and captivating with very manageable recipes. Eric Prum and Josh Williams come from beverage and design backgrounds and it shows in how they approach the recipes. You will be compelled to dive into the images and assert an invitation to the adventure. As you can imagine, all of the cocktails should be mixed with a Mason shaker. It’s not compulsory, but you will look much cooler doing so. If no one is watching, feel free to use what you have. The front of the book provides essentials like appropriate ice, tools, and standard spirits. Recipes are separated by the seasons making it easy to search for drinks depending on what’s in your pantry or growing on your windowsill. Since it is fall and unusually warm outside for even late October in the Bay Area, I decided to make The Indian Summer. Yum. Sip. Yum. This cocktail captures the flavors of the transition from Summer to Fall. Concord grapes, ripe from hot weather, combine with St-Germain and gin for a floral kick-off to the season. Makes 2 drinks. i. Add the Concord Grapes to the Shaker. ii. Muddle the Grapes in the bottom of the Shaker until thoroughly crushed. iii. 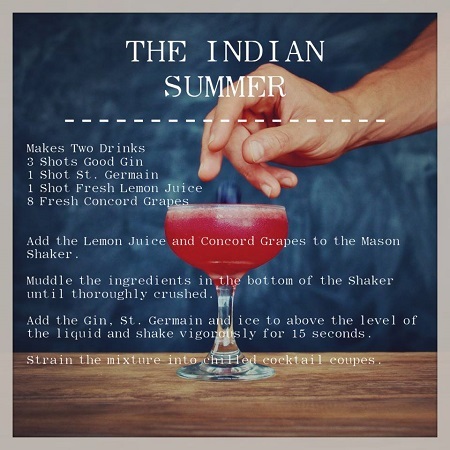 Add the Gin, St-Germain, Lemon Juice, and ice to above the level of the liquid and shake vigorously for 15 seconds. iv. Strain the mixture into chilled Coupes and garnish with remaining Grapes. Last week I received a “sweet” package in the mail. With names like Peach Sorbet and Raspberry Shortcake, you’d think that I had a secret admirer with a sweet tooth. As much as I appreciate a good dessert, these gifts were plants from Fall Creek Farms in Oregon. 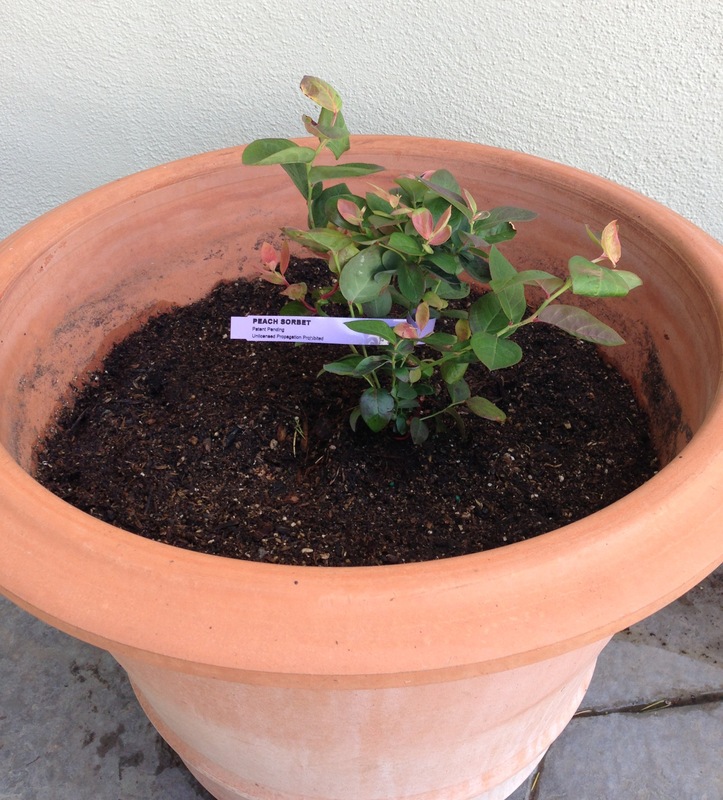 Both are patented varieties of a blueberry and raspberry plant, targeted to home gardeners with little space and minimal skill. Even though I write about gardening, I don’t consider myself a gardening expert, but I’m always willing to try something new. A couple months ago I had a nice conversation with a garden-focused PR firm, Garden Media Group, and they mentioned that they would like me to participate in a trial so that I would hopefully write about my results for the SF Chronicle. I had forgotten about it until my package arrived. 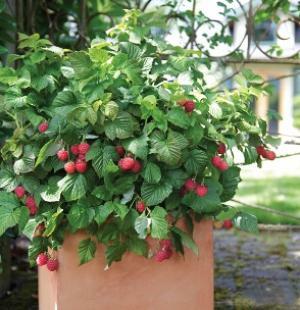 Raspberry Shortcake is the wholesaler’s inaugural variety in their BrazelBerry collection. It’s a dwarf raspberry that maxes out at 36″. 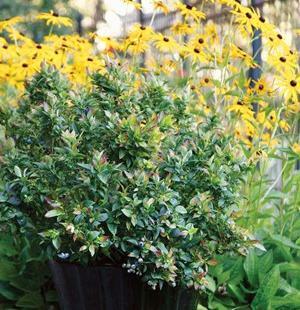 It’s perfect for patio containers, is thornless, and doesn’t need a pollinator. If planted in the fall, it would have produced fruit by now. But since I just now potted it, I’ll look forward to a crop next year. Also, new canes will produce fruit in spring. Once fruiting is finished, prune out canes at the base that have fruited, leaving new canes to fruit next season. Peach Sorbet is billed as a four season show stopper as it has beautiful foliage in the spring and fall in addition to lovely white flowers before setting fruit. In most mild climates it will keep its foliage year round and can turn deep eggplant in color. 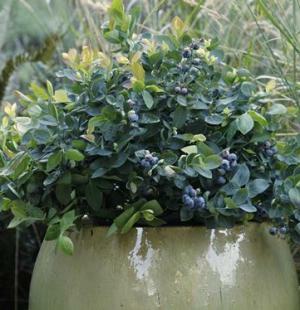 Many gardening books and landscapers have been jumping on the blueberry bandwagon and praising this plant for its ability to be a decorative hedge and produce amazing fruit. Edible gardening 2.0. All varieties in the BrazzleBerry collection are self-pollinating. Also, the plant produces new canes each spring and fruits on them. Once fruiting is complete, prune canes that have fruited leaving new canes to fruit next season. Annual pruning promotes plant growth and berry production. Made the trip from Oregon in better condition than my Raspberry. Check the BrazzleBerries website for availability by entering your zip code in the “Where to Buy” field. Since I last wrote about cocktail gardening for the SF Chronicle, I have been busy mixing up all kinds of drinks. I recently received samples of a delicious new premium rum, Shellback Caribbean Rum from Barbados. Shellback is a title that a sailor receives after sailing across the equator. Both the silver and spiced versions, or white and dark, are nothing like I have sampled before. I guess it’s time for me to grow up and ditch that Bacardi from ten years ago. Kind of like trading in your Charlie fragrance for Balenciaga. Taking a more mature, thoughtful approach to cocktails means upgrading your selections to small-batch distillers and carefully crafted spirits that tell a story, and exploring unusual flavors that make up these complex elixirs. By all means, pour yourself a shot of these types of pricy concoctions, but if you do you’ll be missing out on the aromas and subtle characteristics that make them so darn delicious. By adding herbs, citrus, and other ingredients that have already been infused during the distillation process, these drinks really become special. I can’t wait for tonight when I’ll be learning the proper mixing techniques from Las Vegas-based mixologist Tony Abou-Ganim. I’ll also start thinking of ways to use both the silver and spiced versions in cooking. Maybe strawberry mint and spiced rum chocolate truffles, or jerk chicken with spiced rum glaze. I swear I’m not addicted to online shopping. It would appear that way, though, from the daily deliveries I’ve been getting. First came a large box of gardening books from the Independent Book Publishers Association. They asked me to be an editorial judge for their annual Benjamin Franklin Awards. These books are either self-published or are being produced by small publishing houses and are a vital part of living in a free society. Many taboo topics or topics not deemed “marketable” by large publishing houses often go unpublished. Organizations like the IBPA provide exposure for small presses and self-published authors. My other deliveries have been coming from mainstream publishers, delivering requested review copies of Spring gardening titles for an upcoming piece I’m doing for the SF Chronicle. 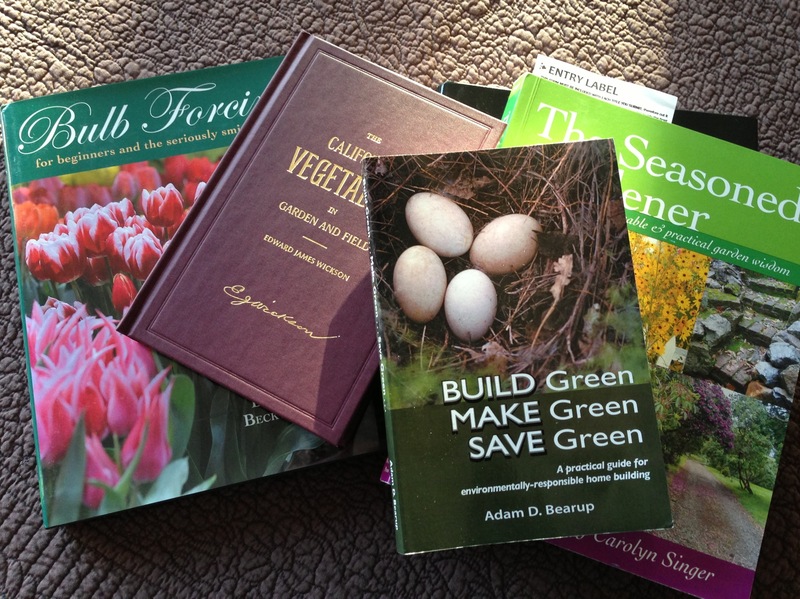 Gardening books are hot right now and many publishers are churning them out. Word on the street, though, is that many authors aren’t being appropriately compensated for their work. As someone who pines to write a book someday, this is troubling news. Non-celebrity authors actually write their own books, many procure or do their own photography, and basically pour several months of their life into a book. They wouldn’t do it if they didn’t already love the subject. But it is a shame that writing has become a disposable art, like so many skill sets, and the more we can find it for free on various platforms, the less we are willing to pay for it. If you can afford to, buy books, especially when they are peddled by the authors themselves. Often these books have already been bought by them and the proceeds go back to them immediately. There’s a lot of good stuff out there this year so garden, read, and garden some more.